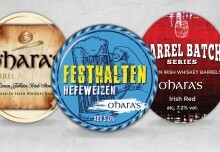 O’Hara’s Double IPA lives up to its name both in terms of flavour and rich ingredients. The abundance of floral flavours from the Amarillo hops and the caramalt sweetness balances perfectly in this full-bodied IPA. The cascade dry hopping combined with this high gravity brew makes this beer a taste sensation for any craft beer lover. Here’s one of our brewers Alan Stokes with some of the highlights of this beer. 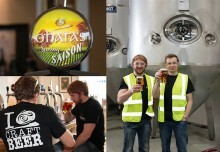 First released at the Irish Craft Beer Village in 2013 in draught and launched in 50cl bottle in November 2013. this full-bodied, full on Double IPA combines caramel and malt flavours with a well-balanced and substantial bitterness. Light carbonation allows the full flavour of this Double IPA to shine through. At 7.5% abv, the high alcohol content is balanced with a caramel sweetness and a full bodied malt character. 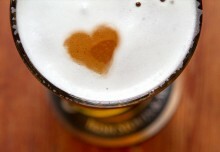 The term “pale ale” originally described an ale that had been brewed from pale malt. During British colonial times demand grew for export pale ales and a strongly hopped pale ale was developed in the late 1800s, hops being a natural preservative and a higher abv lending the beer style better suited to the long voyages, particularly to India, hence the style name IPA. While records show that American breweries were brewing beers of a similar style during this period, breweries in the US brewed with a single hop or a combination of hops with more fruity floral notes compared to the more accentuated bittering hops used by British breweries. Double IPAs (also referred to as Imperial IPAs) are a stronger, very hoppy variant of IPAs, typically have an abv of 7.5%. O’Hara’s Double IPA embraces both styles combining the full bodied base of our Irish malts with a combination American and European hop varieties, where the Cascade hop dominates. 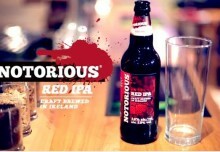 This beer is available now independent off-licences and bars throughout Ireland.